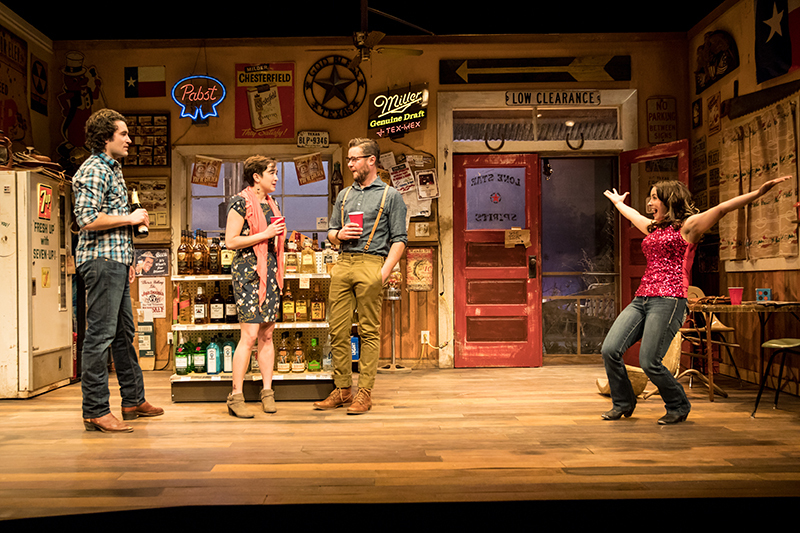 Y'all, Jungle Theater's Lone Star Spirits got me feeling all the feels! Hilarious and heart-breaking, it's one of the best plays I've seen this year. Brought to us by wife/husband director/playwright team Sarah Rasmussen and Josh Tobiessen, it features crisply drawn characters beautifully brought to life by a brilliant five-person cast, an incredibly detailed and realistic set, family drama, a poignant exploration of small town life, ghosts, country music, and accidental gunshots. I was laughing throughout the show and wiping away tears at the end, which is pretty much my favorite kind of play. Friends, you'd be wise to get on down to the Jungle between now and May 7 to experience this practically perfect 90 minutes of theater. 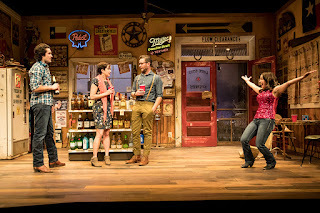 The entire play takes place in a small town Texas liquor store that's so realistic, you'll want to hop up on stage and buy a beer. And that's exactly what you can do before the show. Sarah Bahr's set functions as a very important character in the story, not just in the ghost of the town's founding father that rattles around occasionally, but as a very representation of the fading small town life. Liquor bottles fill aisle one and aisle two of the tiny store, a glass-front refrigerated case contains beer and water (but no juice or milk), walls are covered with beer signs, license plates, and posters, and the shelf behind the counter is crowded with miscellaneous mementos of life. The proprietor of said liquor store, Walter, is expecting a visit from his daughter Marley, who moved to the big city with her mother as a teenager and hasn't been around much since. She shows up with Ben, her Austin hipster boyfriend, er... fiance, and is surprised to find her ex-boyfriend Drew also waiting for her. High school friend Jessica soon shows up, and it's in the mix of these five characters that all the good stuff happens. It's a culture clash between those who stayed in the dying small town and those who left it behind. I did not grow up in a small town, I grew up in the suburbs which is a whole different animal. But both of my parents are from small towns and the world of Lone Star Spirits feels very familiar. 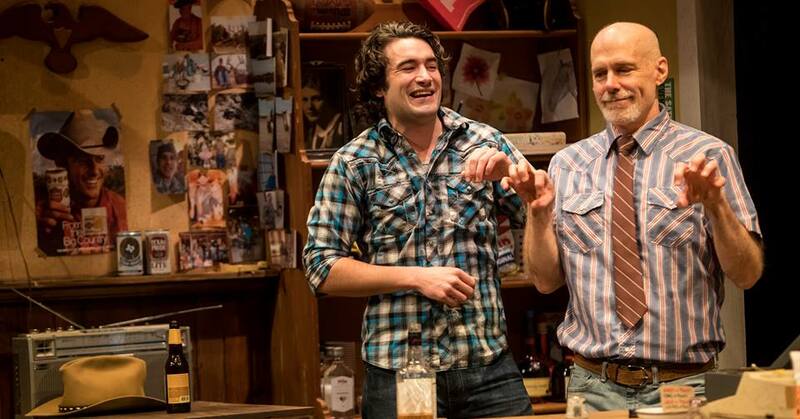 There's a value to the small town life, but there are limitations to it as well, which is what this play deals with so very well. These characters are not dumb or simple as they might first appear. Jessica may be a single mom who gives her son waffles for dinner with margarita mix as a substitute for juice, and puts on a sparkly top for girls night out, but she's also a nurse who's just trying to keep living after her husband died in Afghanistan. She sagely and wearily responds to the question "are you happy?" with "what kind of a silly question is that, of course I'm not happy, I'm an adult, happy is for children." Jessica's too busy surviving to think about happy. Christian Bardin gives a performance that feels 100% authentic in attitude, emotions, and accent (maybe because she's from Texas herself), with impeccable comic timing. Drew is the kind of guy whose very identity is defined by the happiest moment of his life - catching the winning pass in the high school state championship football game ten years ago, like Tim Riggins only much more talkative and much less smooth (and let's face it, we all know someone like him). Pathetic, maybe, simple, yes, but Drew is also unfailingly loyal to his friends and sweet and thoughtful when he steps up for those in need. Nate Cheeseman is completely charming and ridiculous and spot-on in his portrayal. Terry Hempleman may be often typecast as the tough Western man's man with an accent and more to him that first appears (see this, and this, and this), but I buy it every time, and I'll happily watch it every time. Walter may be his best creation yet, a man full of regrets yet content in the life he's built, trying to reconnect with his daughter as she's moving forward toward the future and he's trying to hold on to the past. The city slickers are equally complex and well portrayed. Thallis Santesteban is strong as Marley, who's tried and mostly succeeded in putting her small town life behind her. She holds things back until more and more of her and the reason for her visit is revealed. Last but not least, John Catron is just perfect as the Austin hipster who sells old-fashioned men's grooming products online but doesn't know how to fix a car or shoot a gun, society's measure of a man. All of these characters are so specific and well-defined, not just in the writing but also in the acting and directing, and even the costuming (also by Sarah Bahr). The moment each character walks on stage, you know who they are. From Walter and Drew's jeans, cowboy boots, and plaid shirts, to Jessica's red sequined top and bedazzled jeans, to Marley's well-tailored floral dress with the tasteful and trendy scarf, to Ben in his hipster glasses, suspenders, and leather cuff. I almost wish the play didn't take place on one day so we could see another outfit from these characters' wardrobes. I often wish that theaters would print a list of songs played before, during, and after the show in the program. Can we make that a thing? In this case I recognized several great old country songs, including Lyle Lovett's "That's Right You're Not from Texas," Tanya Tucker's "Two Sparrows in a Hurricane," and Gretchen Wilson's "Redneck Woman." It's just one more level of detail to add to the creation of this world. Lone Star Spirits premiered off Broadway just last year, but I can't imagine that production was any better than this one, with a director who probably knows the playwright better than anyone, spot-on perfection in design, and five of the Twin Cities best actors well cast in their roles and at the top of their game. 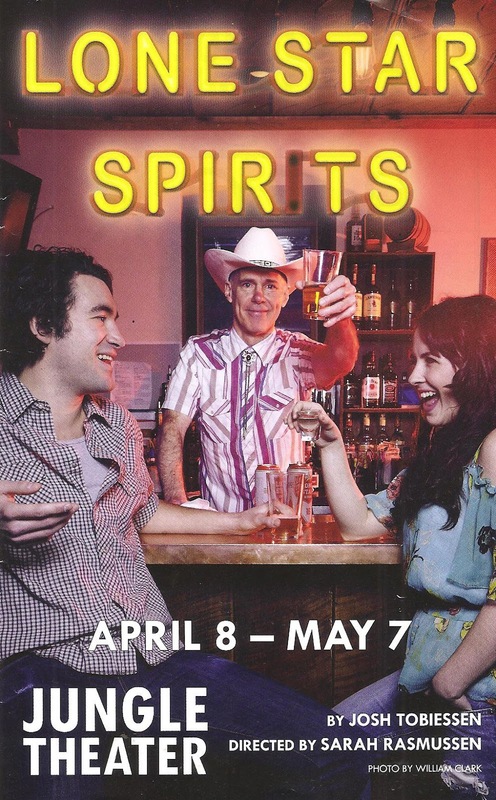 Lone Star Spirits continues through May 7 at the Jungle Theater in Uptown. 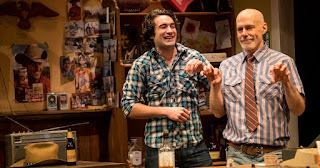 Remember to get there early to find parking in the busy neighborhood, buy a drink from the on stage bar, and settle into the cozy and intimate theater space to be swept away by these beautifully human characters and their story.